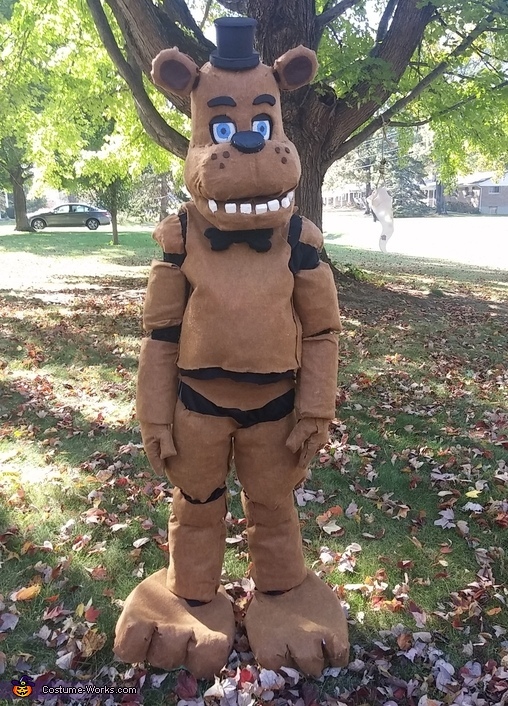 David, my 11 year old, always loves making the yearly homemade costume. This year, he asked to be Freddy. (not the one I thought!) We looked up all details in pictures and videos. His head is created with a plastic flower pot, car sponge, duct tape, felt and more. We made the hat from a solo cup cut in half, and his eyes are black plastic screen with painted eyes. The body is felt stuffed with crumpled paper (for mass/muscles/fat) and adhered to black pants/turtleneck with lots of hot melt glue! He was able to wear it as Staff at a Boy Scout function, and the younger cub scouts absolutely loved it! Afterwards, we had servers at a local restaurant asking to take pictures with him.